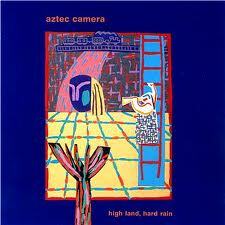 As the singer-songwriter and guitarist of Aztec Camera, Roddy Frame was credited for the band’s success and at the tender age of 19, managed to produce “High Land, Hard Rain”, now proven to be an under-rated classic from 1983. Packaged with sentimental and forlorn love songs, “High Land, Hard Rain”, is an impressive debut, which stretches the pop genre without committing to the new-wave pop so prevalent at the time. Instead, “High Land, Hard Rain” is an original diversion of acoustic pop, dabbling with folksy, Spanish and post-punk overtures. From the infectious, “Walk out to Winter”, to The Cure-esque, “Lost Outside the Tunnel”, from the heart­felt “We Could Send Letters” to the Dylan-esque “Down the Dip”, Frame meticulously wrapped his acoustic virtuoso guitars around the earnest and sophisticated backdrop. Lyrically the album is a mixture of Frame’s youthful idealism and sometimes “older than his years” insights. It’s also an album where Frame makes subtle references to his own influences, such as The Clash with the line: “Faces of Strummer that fell from your wall.” in “Walk out to Winter”. However, if there was ever two songs which defined this album it would have to be the radio-friendly, “Oblivious” and the lonesome and anthemic “Boy Wonder”. Whereas “Oblivious” beats with a sprightly, boy meets girl innocence, “Boy Wonder” highlights Frame’s alienated youth, illustrated through the poignant Lyric: “Dry your tears, tie your tongue and you’re never sixteen, And I’ll give you a glimpse of the hard and the clean…” Both songs encapsulate the paradoxical theme of Frame’s youth. Whilst the folksy-raw acoustics of “Boy Wonder” confronts with its foot-stomping and angsty chants, “Oblivious” saunters with confidence and pulsates under the moonlight. With a duality of Spanish acoustic guitars, “Oblivious” showcases the intricate, nimble-fingered guitar playing of Frame, which single-mindedly sprints across the sunny soundscape. Along with its semi-soulful backing vocals, funky Farifsa organ, bouncy bass and jingle-jangle percussions, “Oblivious” is a fervent love song, which loosens with its upbeat and spacious interludes. It’s also a song whose boyish vocals of Frame synchronise with the coming of age lyrics: “I see you crying and I want to kill your friends,” and “They’ll call us lonely when we’re really just alone“. Despite Frame’s rudimentary talent during the making of this album, “High Land, Hard Rain” still remains timeless, sounding as fresh as it did all those years ago.